On this fabulous African American festivity, celebrate all seven days a bit differently. 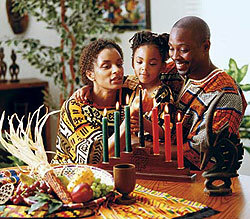 To start the joyful occasion make your homes beautiful by placing the Kwanzaa alter or table at a suitable place. Adorn the rooms of your homes with hanging pictures, colorful posters and banners. Bedeck homes with fine looking African sculptures to match the colorful theme of Kwanzaa. Handful of Kwanzaa crafts and other decorations should be created according to your own tastes and preferences. All the seven days of Kwanzaa bring new meaning and principles of the Nguzo Saba. A new candle is lighted each day to represent one of these doctrines of Kwanzaa. Even though there is no specific rule about lighting the candle but most of the families traditionally pass the responsibility of lighting the candle to the youngest member of that particular family. Nevertheless, some families think it a bit differently. Some families pay the tribute to the eldest family member by giving him or her honor of lighting the candle. Black candle, placed right in the middle of red and green candles in Kinara, is lit on the very first day of the festival. It marks the commencement of the festive season. The person who takes the responsibility to light the candle makes a statement about the first principle i.e. 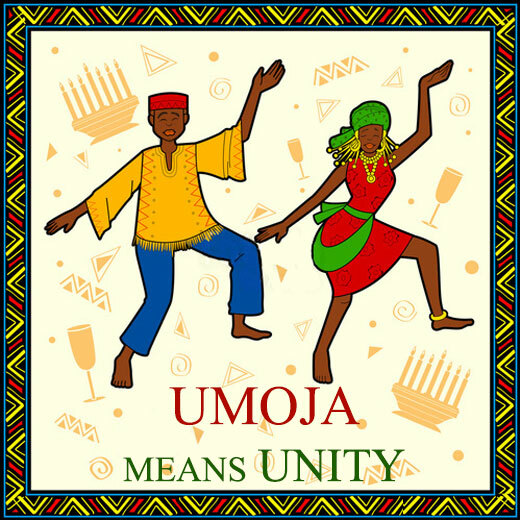 Umoja (oo-MOH-jah) or unity. All the family members should listen to the statement and understand it in a way that all of them can explain the doctrine and its meaning. At times that particular member shares a passage or poem which is related to their lives and the principle in some way or the other. The Umoja (Unity cup) filled with fruit juice is passed to all the members present in that congregating spot. Some of the families use a Unity cup for every member present where as some just like to keep a Unity cup in the centre of the Kwanzaa table. After the ceremony of sharing fruit juice is over, the candles are turned off till the very next day. To represent the second doctrine or principle the left most red candle is lit after the black one. 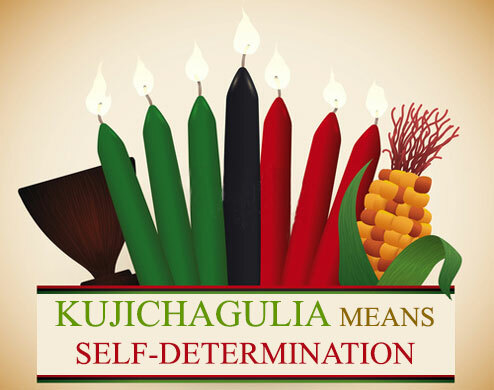 This principle represents Kujichagulia (koo-jee-chah-goo-LEE-ah) or Self- Determination. The process goes on in the same way. The person who lights the candle on 2nd day makes a statement which is related to the second principle. He or she also continues with a passage or a poem on that particular principle and explains how this doctrine is related to the meaning of their lives. The Unity cup is again shared between the members and the candles are extinguished. 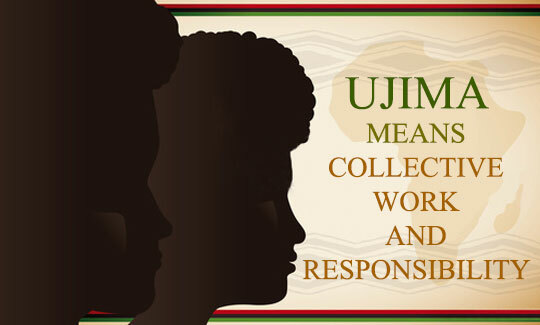 This is the time to emphasize on the 3rd principle of Kwanzaa, Ujima or Collective work and Responsibility. On the third day, the lighting of candles starts again with the black one, then the farthest left red one and them the utmost right green one are lit. The family members who congregate discuss the meaning of the 3rd principle and share Unity cup. The candles are then extinguished. On the fourth day of Kwanzaa, the black candle is lit at first, then the utmost left red one, then the farthest right green one and at last the next red candle, placed at the left hand side of the black one, is lit. It represents the 4th principle, i.e. 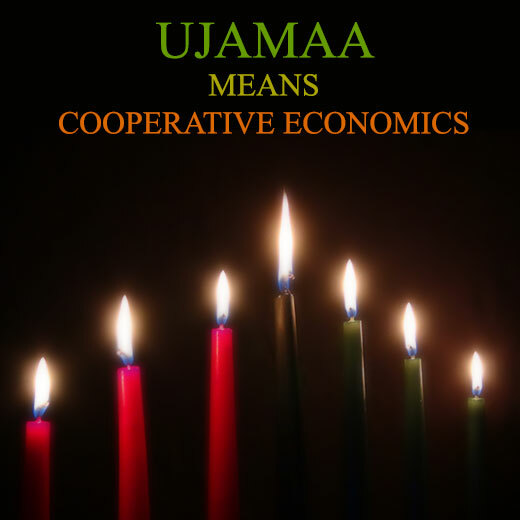 Ujamaa (oo-jah-MAH) or Collective Economics. The fourth principle is then discussed with the present members. The Unity cup is shared and the candles are turned off. The black candle, then the left most red candle, then the right most green candle, then the 2nd red candle at the left hand side and lastly the next green candle are lit in the same sequence. This represents the 5th principle i.e. 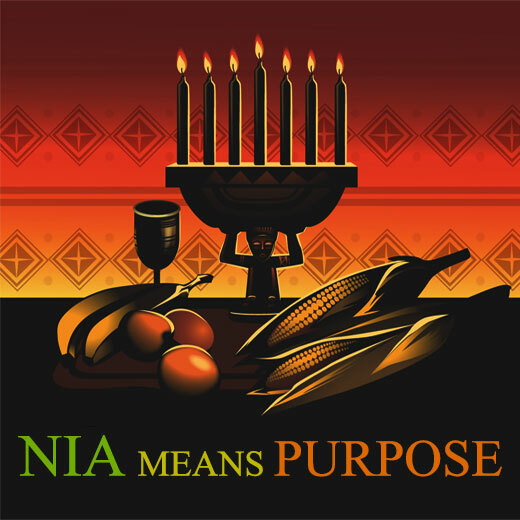 Kwanzaa - Nia (NEE-ah) or Purpose. Members discuss the fifth principle and share Unity cup. The day ends with extinguishing the candles. On the sixth day during Kwanzaa the black candle is lit, then the utmost left red, the extreme right green, the next red, the subsequent green and then the final red candle. This represents the 6th principle of Kwanzaa i.e. 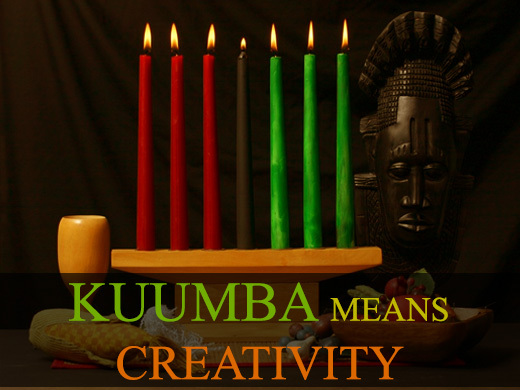 Kuumba (koo-OOM-bah) or Creativity. The sixth day falls also on the New Years day and is a very special and momentous day for the African Americans. This is the day of Karamu or Kwanzaa feast. The spirit of celebration increases a lot when many of the family members invite their loved ones and friends. To enhance the celebration mood, decorate the home with traditional Kwanzaa colors. The African American music at the background and traditional attires should match the Kwanzaa theme. Special holiday dishes are included in the celebration. Prepare fabulous and spicy dishes for the guests. Plays are performed, family members read out passage and poems which are related to the seven principles of Kwanzaa. A story teller enjoys the centre stage in the feast. The focus of the day should be on creativity. Try to show innovation and creativity in everything. Present members remember their own ancestors while the Unity cup is shared. The candles are turned off after everyone enjoys the drink. Tamshi La Tutaonana (TAM-shi la Tu-ta-u-NA-na) which was written by Dr. Karenga, the inventor of Kwanzaa, is read by the eldest member of those present before the conclusion of the Karamu ceremony. This is a farewell statement for the feast and the year. Each and everyone conclude the Karamu saying "Harambee!" for seven times. On the seventh and last day of Kwanzaa, the black candle is lit, then the farthest left red, the utmost right green, the next red candle, the 2nd green candle at the right hand side of the black candle, the final red, then the last and final green candle. 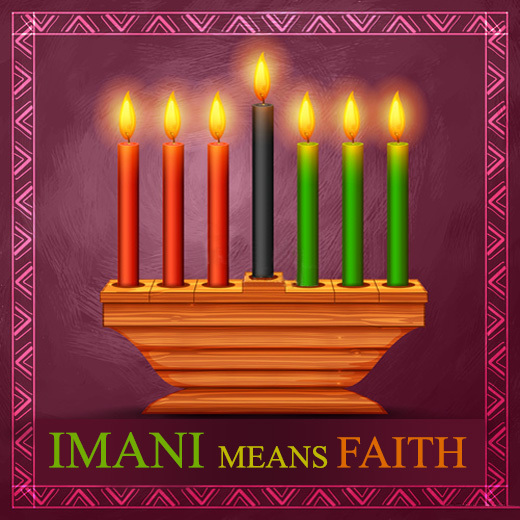 This represents the 7th Kwanzaa principle, Imani (ee-MAH-nee) or Faith. As like any other days of Kwanzaa the principle of the day is discussed, the unity cup is shared and the candles are extinguished. This marks the end of Kwanzaa for the particular year. As the festival is relatively new one, many families decide to celebrate the occasion in their own ways and pass on the tradition to the next generations as well.